Our corporate member Peter Weckström makes the best coffee in Bangkok. Peter can deliver the freshly roasted coffee to your workplace directly whether you want coffee beans or grinded coffee. Not too much at the time so It is always fresh. You can pick the ingredients from countries like Colombia, Ethiopia, Kenya, Indonesia, Costa Rica or Thailand. Peter can discuss with you the quality and price best suitable for you company needs. Coffee is like bread, best when it is fresh!! None of the large coffee shops in Thailand can match this freshness!! Peter has been roasting coffee since 1996 and in Bangkok since 2007. Peter knows where to find the best coffee beans and keep the quality high. How many people you have in your workplace? Do you use coffee beans or grinded coffee? According to your feedback Peter will be in touch with you soonest and suggest a meeting in your company and discuss the coffee needs further. https://thaifin.org/wp-content/uploads/2019/02/Näyttökuva-2019-2-26-kello-14.45.27.png 547 683 TFCC Editor https://thaifin.org/wp-content/uploads/2015/02/tfcc_logo.png TFCC Editor2019-02-26 14:52:042019-02-27 10:09:36Best coffee to your office - delivered! The Thai-Finnish Chamber of Commerce is looking for a motivated, entrepreneurial and results- oriented person as its new Executive Director. Our present ED Mr. Karri Kivela, having worked 5 years for our Chamber, will return to Finland by May this year. * Being the Chamber’s main contact with members, both potential new members and maintaining contact with existing members. The Thai-Finnish Chamber of Commerce (TFCC) is a member-driven, non-profit, non-governmental organization, which was initially founded as the Thai-Finnish Trade Association in 1988 with the aim of facilitating trade and investment between Thailand and Finland. The organization expanded into a Thai-Finnish Chamber of Commerce in 1992. TFCC is dedicated to the promotion, advancement and protection of its members’ business interest as well as commercial relations between Thailand and Finland. 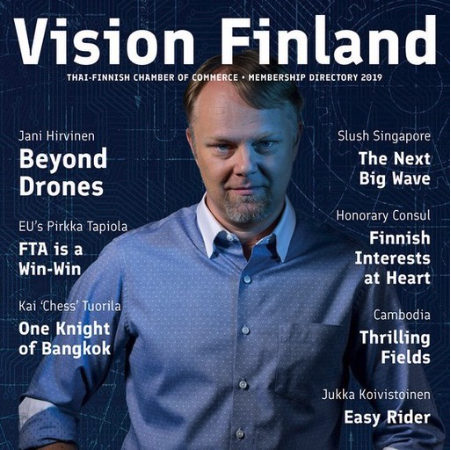 TFCC shares this mission with other Finnish Chambers and Business Councils in the region and is an active partner in the Team Finland work and with the Embassy of Finland in particular. TFCC office is located in Forum Tower, near by the Huai Kwang MTR station with easy access to different parts of Bangkok. The Chamber can offer an exciting job with a variety of work tasks. The successful candidate will get invaluable international work experience and will be able to build a professional and social network. by 11.3.2019. Please send your application as soon as possible – applications will be reviewed continuously, and the position might be filled before the application deadline. , or by phone +6661 7086006.
https://thaifin.org/wp-content/uploads/2019/02/Näyttökuva-2019-2-11-kello-12.18.12.png 186 191 TFCC Editor https://thaifin.org/wp-content/uploads/2015/02/tfcc_logo.png TFCC Editor2019-02-11 12:21:502019-02-11 13:24:53TFCC IS LOOKING FOR A NEW EXECUTIVE DIRECTOR! Embassy of Finland is pleased to invite you to the presentation of the Team Finland priorities and activities 2018 and to the launching of TFCC’s new strategy and services. In light of the EU Gateway | Business Avenuess business mission to Singapore and Thailand on the Information and Communication Technology Sector of May 22 to 27, join the South-East Asia IPR SME Helpdesk for a Webinar Session on ICT in Thailand: IPR Protection on 11 May 2017. Thailand’s ICT Sector is growing rapidly, and the Thai government is placing heavy emphasis on its development. This provides the perfect circumstances for EU SMEs providing ICT technology and interested in expanding in South-East Asia to further explore the many possibilities Thailand might offer. However, true to our motto “Know before you Go!”, we would like to emphasise the IPR risks and essentials which come along with any new foreign market. So join the South-East Asia IPR SME helpdesk on Thursday, 11 May 2017, 10:00 – 11:00am (Brussels time), 15:00 – 16:00pm (Bangkok time), you are welcome to join Helpdesk experts Mr. Nic Garnett for a webinar session ” ICT in Thailand: IPR Protection“. Mr. Garnett will give European SMEs a comprehensive overview of the IPR landscape in Thailand, opportunities that this sector may offer and how to best tackle these, as well as relevant best practices in the shape of case-studies. The free of charge web-based expert presentations provide cost-effective, applicable business advice, including practical IP steps to be taken before and during business activities in or related to the ICT Sector in Thailand. The webinar includes interactive poll questions and case study examples. Get valuable insights from our expert, ask questions live throughout the webinar and receive expert response during the Q&A session! Nic Garnett, a consultant with Inter Right (Asia) Co. Ltd , is an internationally recognised expert on the management and protection of copyrights, and a leading lawyer in e-commerce. Nic has represented major online content service providers and rights holders in the licensing of exploitation rights in Asia, the United States and across the European Union. He has advised a wide range of international clients on diverse aspects of e-commerce and internet law, including areas such as security, data privacy, distance selling, e-money, and website contracting. His knowledge of digital media technologies, especially those deployed in the protection of copyrights, has led to extensive advisory work with clients such as the UK Government and the World Intellectual Property Organization, for whom he has written a number of major studies on the relationship between copyright and technology. A UK-qualified lawyer, Nic holds a postgraduate degree (D.E.A.) in French private law from the Université de Bordeaux, and he received his Masters of Arts in Law from the University of Cambridge. He spent 10 years in Silicon Valley working as both in-house counsel and as a business consultant in the digital media field. His previous assignments include leading the international music recording industry’s anti-piracy efforts in Asia and in Eastern Europe, as well as the organisation’s standardisation efforts in new technology. Nic joined the Helpdesk network in February 2014.
. You will receive a reply from one of the Helpdesk experts within three working days. The South-East Asia IPR SME Helpdesk is jointly implemented by DEVELOPMENT Solutions, European Union Chamber of Commerce in Vietnam, Thai European Business Association & European Business Network. The Nordic Chambers in Thailand organized a Nordic Networking event in Westin, Altitude bar on Thursday, April 21st. There were about 80 people enjoying the great Nordic food and drinks in the beautiful Altitude bar with a great view over Bangkok. We were happy to have people from other countries participating as well as there were guests from Germany, Mexico, Thailand and the Netherlands. We are very glad that so many Thai-Finnish Chamber of Commerce members showed up as there were more than 20 people from Finland. The next Nordic networking event will be organized in the Fall 2016. Hope to see you then again! !